2If you are using quinoa, soak the quinoa for 15 minutes in a medium pot. 3Slice the onion into thin rings. In a small frying pan, caramelize the onions in 1 tbsp olive oil over medium-low heat. Be sure not to burn them. 4Chop carrots and sunchokes (or potatoes) into thin bite-size pieces. On one baking sheet, spread out the rabe/baby broccoli and on the other baking sheet spread out the sunchokes and carrots. Drizzle with olive oil and sprinkle with salt and pepper. Use your hands to help toss the vegetables so they are coated with the olive oil. 5Place the carrot and sunchoke tray in the oven. Bake for 20-25 minutes. Don't place the rabe tray in the oven quite yet. 6Rinse and drain quinoa and place back into the pot. Cover the quinoa with water so there is 1 inch of water above the quinoa. Cook on medium heat until all the water has been absorbed. Be sure to stir frequently. Set aside when done. 7Place the tray of rabe/broccoli in the oven with the other tray and bake for 10-15 minutes. 8While the vegetables are roasting and quinoa is cooking, prepare the cream sauce. Place the caramelized onions + remaining sauce ingredients in a high powered blender. Blend on high until smooth, about 1 minute. 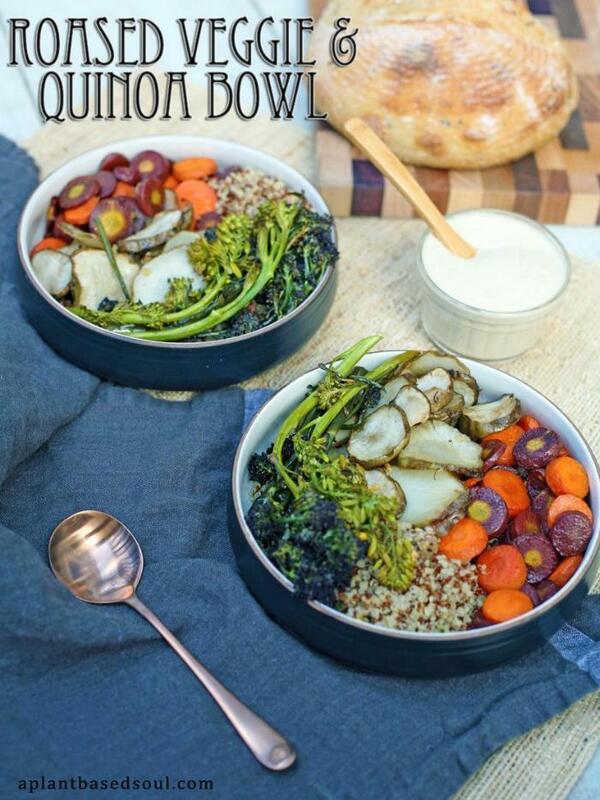 9Assemble bowls by dividing vegetables and quinoa into two portions. Top with caramelized onion cashew cream and serve warm.